A classic element of traditional garden design, hydrangeas (Hydrangea spp.) have been bred to produce a variety of colors, shapes and forms. Choose companion plants that have similar needs to make your garden easier to maintain and to create an attractive display of contrasting colors and textures. Some hydrangea flowers change color with modified soil pH. Varieties of oakleaf hydrangea (Hydrangea quercifolia), which grow in U.S. Department of Agriculture plant hardiness zones 5 through 9, can reach between 8 and 12 feet tall and wide. Varieties of smooth hydrangea (Hydrangea arborescens, USDA zones 3 through 9), also called wild hydrangea, only reach 3 to 5 feet tall and wide. Bigleaf or French hydrangea (Hydrangea macrophylla, USDA zones 5 through 9), feature the classic mophead or lacecap flower clusters and are either deep blue in acidic soil or pink in alkaline soil. Panicle hydrangeas (Hydrangea paniculata, USDA zones 3 through 8) sport cone-shaped white or cream flowers that fade to pink in the fall. These cultivars reach a height and spread of 6 to 10 feet or more. Here are some good companion species for hydrangea. Hostas enjoy similar growing conditions to hydrangeas. 'August Moon' hosta (Hosta 'August Moon,' USDA zones 3 through 8) is a medium-sized hosta with heart-shaped leaves. 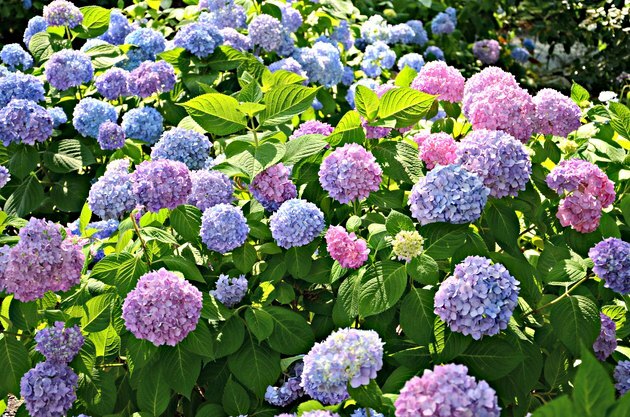 The appearance of lavender to white flowers in late summer or early fall is well-timed with the color transformation that many hydrangea flowers undergo at this time. The showy lavender-colored flowers of the variegated 'Liberty' hosta (Hosta 'Liberty,' USDA zones 3 through 8) complement hydrangeas that are in full bloom in July. Chinese plum yew (Cephalotaxus fortunei, USDA zones 7 through 9) is a coniferous evergreen shrub that makes a good backdrop for hydrangeas. Blue evergreen hydrangea (Dichroa febrifuga, USDA zones 7 through 10) is botanically related to hydrangea but is evergreen. Boxwood shrubs (Buxus spp., USDA zones 4 through 8) such 'Green Mound' (Buxus 'Green Mound') or 'Green Velvet' (Buxus 'Green Velvet') provide a low-growing edging for hydrangea in cooler climates. Florida flame azalea (Rhododendron austrinum, USDA zones 6 through 10) provides a burst of yellow-orange color in spring. 'Midnight Flare' azalea (Rhododendron 'Midnight Flare,' USDA zones 6b through 9) features velvety red flowers in summer. In soils with a low pH, Japanese camellia (Camellia japonica, USDA zones 7 through 9) produces white, pink, red or yellow blooms from October through March, when hydrangeas are dormant. 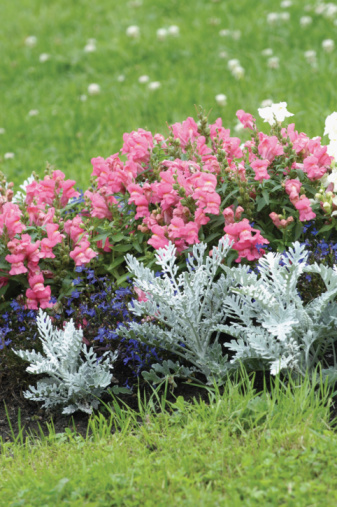 What Flower Can I Plant With Snapdragons? Are Azaleas an Annual or Perennial Plant?